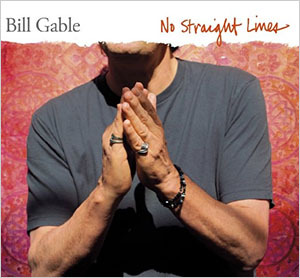 At his sublime best, Bill Gable’s recordings are so singular that comparisons with other performances of similar repertoire are not relevant, so much has Mr. Gable evolved into something that follows his own expressive rules that may be solidly based in contemporary musicology precepts and yet he never feels restricted by them. Not only does Mr. Gable’s music have a more exterior than most, there is also an attractive soft-focus quality in this his fourth outing as a soloist. His lyricism could never be hidden under a bushel at the best of times, but now even more so will his profile rise from his proverbial quietude of his extraordinary music No Straight Lines, is like a curve in the road, a bend in the river and like those earthy metaphors there is no telling what Mr. Gable will come up with from song to song, except that he will continue to be the exquisite troubadour that he is capable of being, moving easily between idioms and genres blurring the lines that separate them as he floats by. His trademark is a high-pitched, counter-tenor that is a blend of vulnerability and sinuous strength. His voice sounds like a choir of singers, working through the polyphony of music, yielding clarity that’s particularly revealing in the dissonant tension in his music’s more intense tone-painting, while also projecting a gravity that past generations of troubadours have also generated. 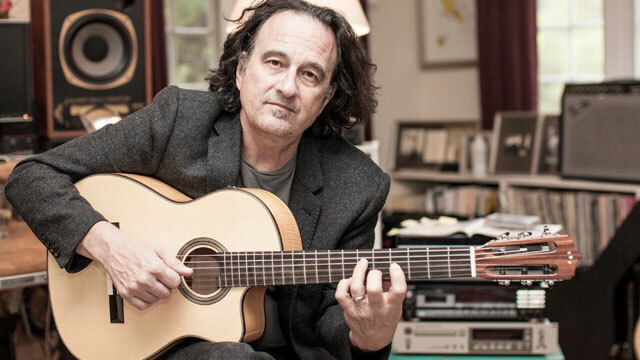 The music here revels in the distinct intimations of acoustic instruments—even in Jimmy Haslip’s bass—and this atmospheric factor to risk putting modern notions of old-world charm in its solemnity and profundity. In any case the intense humanity of the singing becomes a unifying factor in all of the pieces. Though I have never heard a recording of Mr. Gable’s that I didn’t want to hear again—so much does it inspire the best efforts of its performers—this one stands with the best including the ones made years ago where his voice was utterly memorable, the strengths being the purity and accuracy of the vocal lines and a sense of how forward-looking the music must have sounded in its own time; when he first appeared on the concert-stage, that is. The body of each piece establishes a certain harmonic playing field familiar to anyone who knows the nature of troubadour music and poetry, though this recording underscores the composer’s rhapsodic departure from all of that when announcing each verse with the lyrically endowed alphabet, together with music enabling it to waft in and out of the listeners’ consciousness with deeply felt Americana, and with a hint of Mediterranean influence. There is an inner calm in the music that is also characterised by a sublime kind of softness, a hushed qui habitere towards the end of the recording complete with the double reeds seemingly wailing in the distance. This is a disc that I never got enough of even after many hearings. Its invention announces itself with every song that appears, seizing the ear with character. Track List: A Million Miles Away; I Threw Your Heart; Where You Find It; Sustenance; Came So Close; Born to Love You; When the Tide Rolls In; No Straight Lines; Road of Pain; End of the Day; All Are One. Personnel: Bill Gable: vocal, guitar, , guitars (6), cello (3), guitarra (4, 8, 11), fretless guitar (8), palmas (4) and percussion (8, 10); Steve Rodby: acoustic bass (1, 2, 7, 8, 9); Jimmy Haslip: electric bass (3, 5), acoustic bass guitar (4, 10) and fretless bass (11); Larry Goldings: piano (1, 2, 8, 9); Greg Ellis: darbouka (1, 11), tambourine (1,7, 11), surdo, triangle, zils, riq, nagara (7), shakers (8, 9, 11), krakeb (8, 11), frame drum, chan chan (8), katak (11), ashiko and nagar (11); Maggie Parkins: cello (1, 9, 10, 11); Leon Ware: background vocals (2, 9, 11); Kai Narezo: Flamenco guitar (2); Ethan Margolis: Flamenco guitar(3, 4); Arturo Solar: flügel (2, 3. 4, 5); trumpet: (3, 11), background vocals (5, 11); Joey Heredia: cajón (2), uru(3), palmas (3,4); Judd Miller: ney and duduk (3), kaval (6), Turkish clarinet (7), trumpet and zurna (8); Alfredo Caceres: Flamenco guitar (3, 5), and tapao (3); Manuel Gutierrez: baila (4, 6); Linda Tavani: background vocals (5), Makeda: background vocals (5); Michael North: background vocals (5); Dimitris Mahlis: oud (7, 11) and cumbus (7); Chris Bleth : zurna (8, 11); Eclipse Quartet: Sarah Thornblade, Sarah Parkins, Alma Lisa Fernandez, Maggie Parkins – strings (9, 10).